The User Guide will show you what you can do with ASAP Utilities. It will tell you how to install the add-in and it gives a description of all the utilities available. In my opinion a good program should be easy to use without the need of any documentation. However during the last years the need for documentation has increased. ASAP Utilities has more tools then ever and this user guide will help you to get the best out of it. 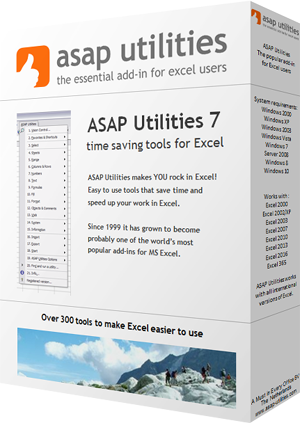 ASAP Utilities User Guide.pdf (20.0 MB). ASAP Utilities User Guide.xps (22.9 MB). This manual (375 pages) can be downloaded as PDF or XPS document. The document is optimized for duplex printing and was last updated on December 12, 2018. The User Guide is in PDF format and you need a program such as Adobe Acrobat Reader or Foxit Reader to access it. You can download Acrobat Reader or Foxit Reader for free.